Samples of an experimental Finlay base from the Kodak Film Samples Collection at the National Science and Media Museum in Bradford. Samples of an experimental Finlay base from the Kodak Film Samples Collection at the National Science and Media Museum in Bradford. Credit: National Science and Media Museum Bradford. Photographs by Barbara Flueckiger in collaboration with Noemi Daugaard. MR. FINLAY, of the Finlay Photographic Processes, Ltd., attended a meeting of the Colour Group of The Royal Photographic Society, held at 35, Russell Square, W. C., on Thursday, May 9th, 1929, Mr. J. Dudley Johnston, President, in the Chair, and gave a demonstration of the Finlay colour process, illustrating it by a large number of very beautiful slides. Mr. Finlay began by remarking that there was evidently a striving to find a greater scope for colour photography than in the past. All photography tended towards the print. Any process that failed to give a print failed by a very long way in achieving what one expected photography to do. One had to look further ahead than the transparency and endeavour to get prints. Nor was it of any use having a process which would yield only one print. Natural colour photography up to the present had been merely the pastime of the amateur. It had not made any real progress until within recent months. The plates had been slow in the majority of cases, for example, in the Autochrome, because one had to give a generous exposure, though with the Paget, of which his own process was a development, one used a panchromatic plate in contact with a taking screen, and the exposure took effect on the surface of the films. With his process they were using the fastest panchromatic plate it was possible to get. The principle was to take a taking screen and expose through it on to a panchromatic plate, which was developed as a separate entity. From the negative a positive was made by contact, and all the taking and viewing screens were interchangeable, so that they knew that without fail they could make any number they wanted from the negative. It was possible readily to duplicate another positive. This involved the use of a screen regular in its structure, and regularity in structure was one big advance in colour photography. 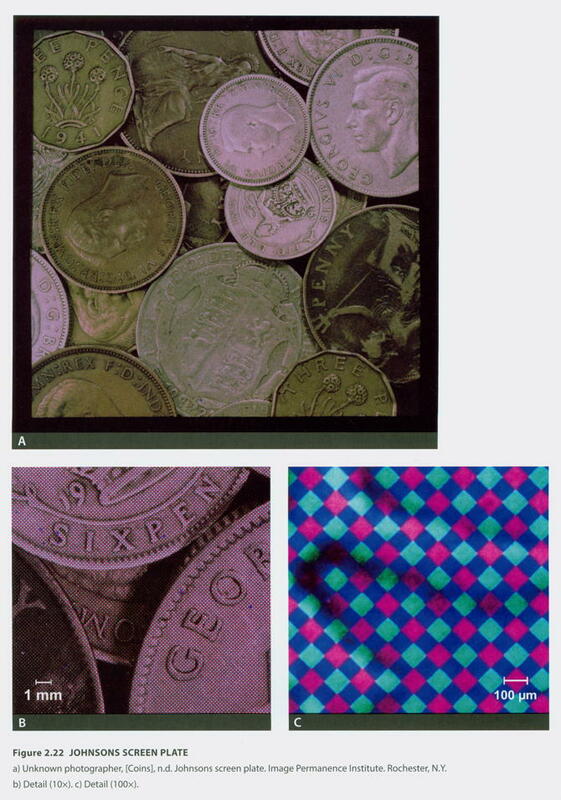 In order to get three- or four-colour prints the negative was taken; they did not go to the positive stage at all, but used the negative as a colour record, and on the one plate had the record of the red, green, and blue-violet exposure. Then all that was necessary was to separate the one from the other at leisure in the studio. 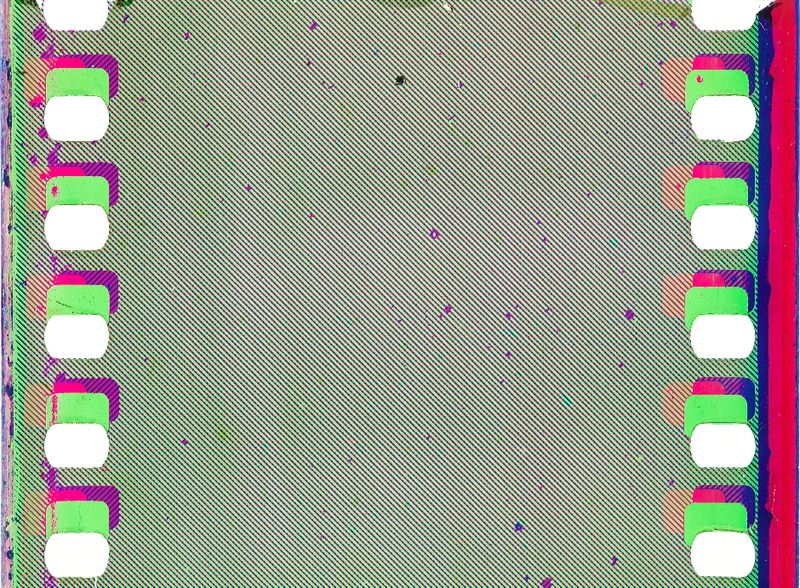 That was done by taking the negative and stopping out by means of a black and white screen which registered absolutely and would transmit only one series of colours. One then projected three positives representing the red, the green, and the blue-violet exposures, and which would represent the blue, the red, and the yellow print plates or papers. The negative was split into its three component parts by means of the stop-out screens. In this particular pattern of screen shown, which many of them would recognise as being the same as the Paget screen, a slightly different stop-out screen was required, but the method of registration was just the same. One had thus three carefully selected positives. There was no overlapping of filters or anything of that sort. Again, one was not limited very much to the size, and it was necessary to use a lantern of some kind to project the image in making the separated positives. Mr. Finlay added that what was being put forward was not any amateur process. This was handed to the half-tone process engraver, who made half-tone negatives, and went on with the three-colour work in the ordinary way. The plate was speedy enough to do work which came within the scope of ordinary newspaper publication. There was no doubt that a time would come when the Daily Mirror would have its back page illustrated in colour, and not in black and white as today. At the conclusion of the lecture Mr. Finlay showed reproductions by his process of the pictures of Dutch Old Masters shown at the Royal Academy between January and March, 1929. The photographs had been taken at the Academy and the original blocks had been proofed and reproofed after the most careful comparison with the paintings. It was now possible for the lover of art to see faithful reproductions in colour of the finest pictures at relatively trifling cost. The lecturer added that he claimed that the eventual outcome of this process would be the production of blocks at newspaper speed within a few years. Somebody had to make a start, and this was the beginning of illustrated news in colour. The plate already was quick enough to do reasonably coloured objects in good light. Mr. NEWENS congratulated Mr. Finlay on the wonderful quality of the slides. He had worked the Paget for a good many years before the war, and the variations were rather trying, but it was evident that the difficulty had been overcome. The richness of the colour and the beautiful quality of the blacks in these slides had been a revelation. He added that the earliest screen plates were inventions of an Englishman and an American, and it was pleasant to think that now they had a British plate which was the equal of any other, and had the advantage of greater transparency and also the possibility of duplication. Miss AGNES WARBURG said that she had never seen anything approaching the correctness of the colour rendering of these pictures. She would have liked to have seen a few outdoor subjects, which perhaps appealed more to the amateur than this work in the galleries. Also she desired to know the degree of enlargement possible. She did not know to what extent the grain would be visible, and whether it would be better to do direct work on a fairly large scale than to enlarge the negatives. Mr. FINLAY explained why, in view of the character of the dot – 1/350th of an inch – very great enlargement would be undesirable. Asked whether a panchromatic plate of 600 H. and D. would be 200 H. and D., with the taking screen and the compensating screen used, he said that he thought it would be less than that. In conclusion he invited the audience to make a closer inspection of some prints produced by three- or four-colour block printing by the method of separating the negative into its three components in the processes used. “Das hauptsächlich in England angewendete “FINLAY-Farbraster”-Verfahren, das sich vom früheren “PAGET-Raster” herleitet und in Band VIII dieses Handbuches, S. 189, unter dem Namen des Duplexrasters beschrieben ist, wurde bis 1930 in einer anderen Form angewendet als seither. Bei der älteren Form (45) dient für die Aufnahme ein besonderes Aufnahmeraster, das Schicht gegen Schicht gegen eine hochempfindliche panchromatische Platte gepreßt wird. Die Verwendung hochempfindlicher Platten ist deshalb möglich, weil die nur auf größeren Formaten verwendeten Rasterteilchen eine etwa 16mal größere Fläche umfassen als die der Kornraster (vgl. Abb. 3, Tafel II); auf diese Weise können Momentaufnahmen von 1/100 Sekunde bei Blende f:4,5 gemacht werden. Die vom Raster wieder getrennten Platten werden zum Negativ entwickelt und davon in der üblichen Weise auf einer Diapositivplatte Kopien angefertigt. Das in der Farbe etwas abweichende, in den Dimensionen dem Aufnahmeraster jedoch gleiche Betrachtungsraster muß Kopie für Kopie mit dem Diapositiv genau zur Deckung gebracht werden, ein etwas mühseliger Vorgang, zumal der zwischen Positiv und Raster immer vorhandene Abstand Anlaß zu Parallaxenfehlern gibt. Für die Herstellung von Teilfarbenauszügen nach dem Negativ wurden besondere schwarzweiße Teilfarbenraster geliefert, deren durchsichtige Teile jeweils der Lage nur einer Teilfarbe entsprachen und mit dem Negativ zur Deckung gebracht werden mußten. “In 1906 Clare L. Finlay of England patented a process that was introduced in 1908 as the Thames Colour Screen. Made up in a precise checkerboard fashion of red, green, and blue elements, rather than the random mosaic pattern used in Autochrome, this separate screen could be used with any type of panchromatic film or plate to make a color photograph. 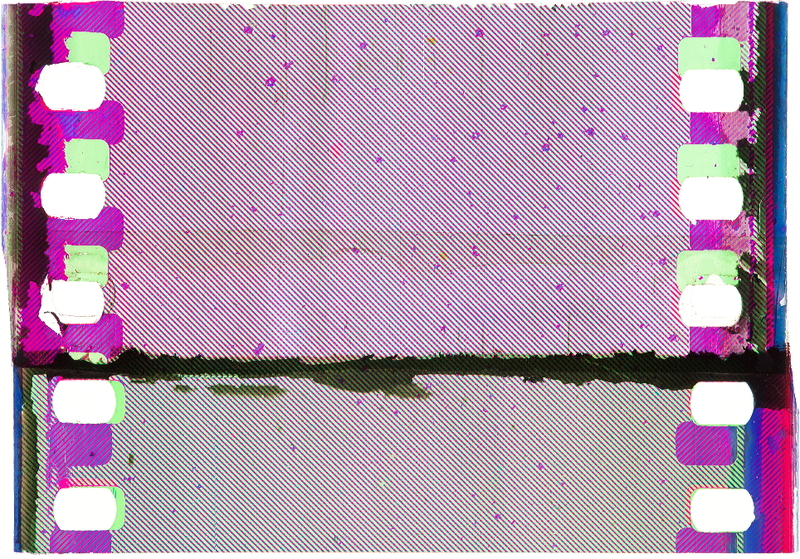 The Thames Colour Plate, which combined an integral screen with the emulsion to form a single plate, was released in 1909. Both of these processes were abandoned after World War I, but improved versions were marketed under the name of Finlay Colour in 1929 and 1931 (Figure 2.11). 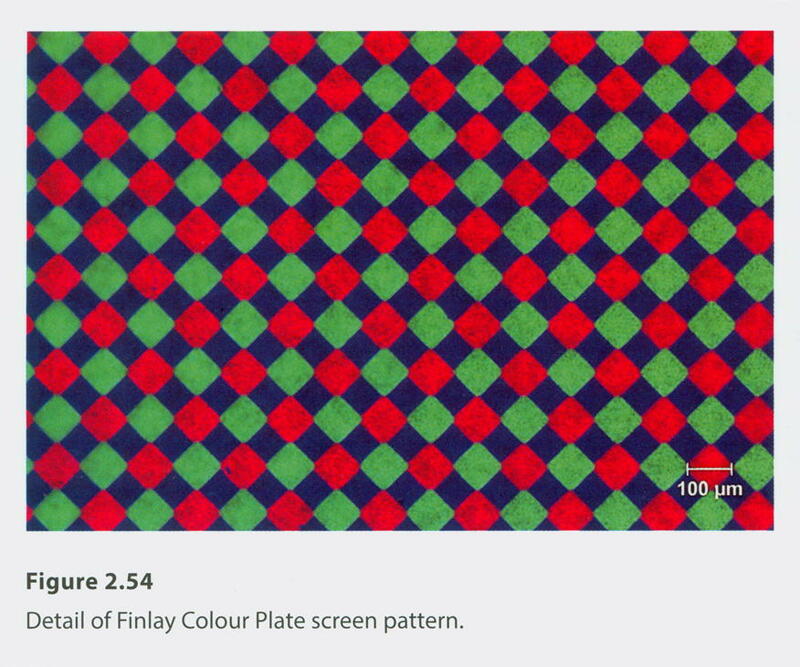 The Finlay Colour processes were to be the major rivals to Dufaycolor until the introduction of subtractive-process materials in the mid-1930s. 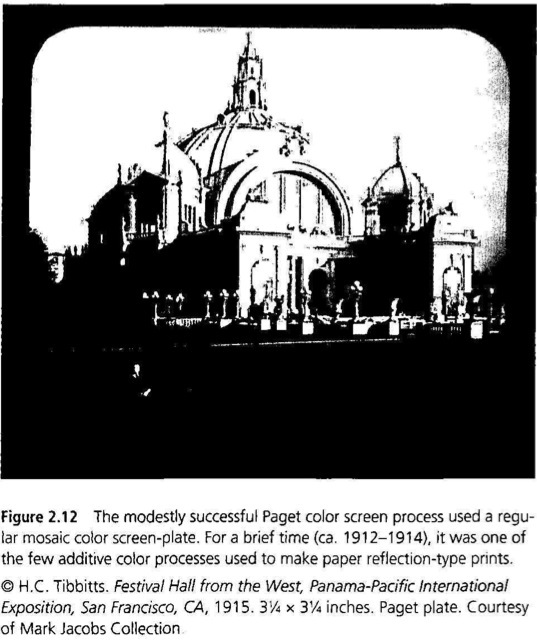 “In 1929 C. L. Finlay revived the Paget plates by introducing the Finlay Colour Plates, one of the last color screen products on glass to appear on the market. 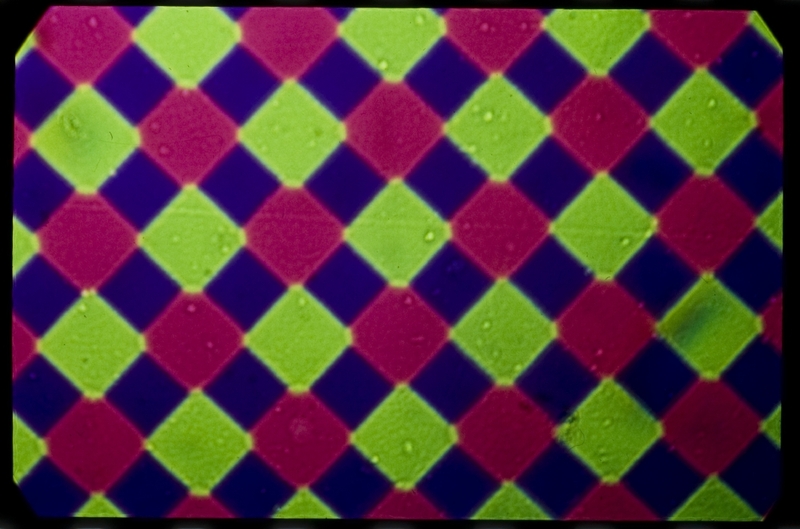 The screen was made of red, green, and blue squares in virtually the same arrangement as on the earlier Paget and Duplex screen plates but with smaller elements (Fig. 2.20). The Finlay plate was first commercialized as a separate system in which a black-and-white positive transparency was bound in registration with a viewing screen. 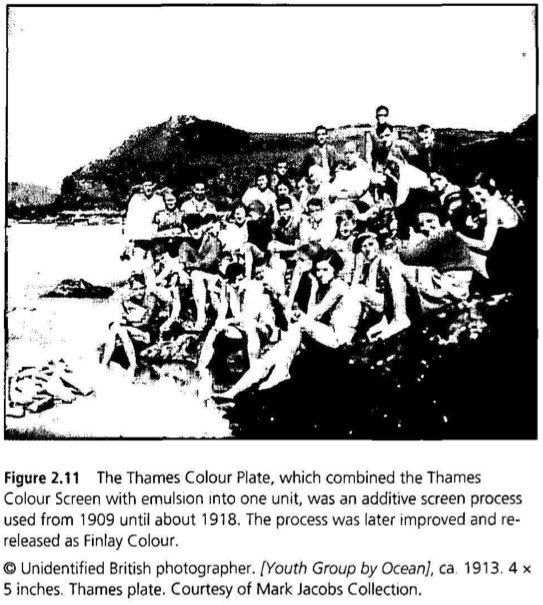 The launching of a combined version of the product called Finlaychrome was announced in 1931 but was still unavailable three years later; it is unclear if it was ever marketed.28 Instead, it seems that the company produced a viewing screen coated with a nonpanchromatic emulsion (Finlay Positive Colour Screen) on which the screened black-and-white negative obtained in the camera was printed. This product is sometimes referred to as Finlaychrome. 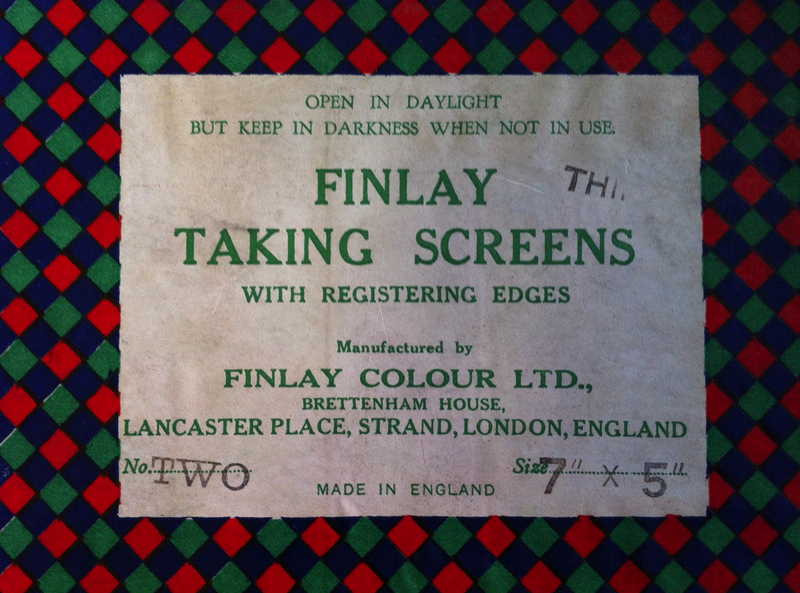 To facilitate registration of the two screens for printing, Finlay Positive Colour Screens carried along each side a series of color-registration marks consisting of bands of red and blue separated by green circles (Fig. 2.21). These marks were also recorded in the black-and-white negative by using a special registering sheath supplied by the company. When the black-and-white negative image was registered with the viewing color screen for printing, these registration marks appeared as magenta circles with an outer band of cyan and an inner band of yellow. In addition to avoiding parallax, transparencies produced in this manner had greater brilliance and could be used to make color separations for printing on paper, via special Finlay “stop-out” screens provided for this purpose (BJP 1932). 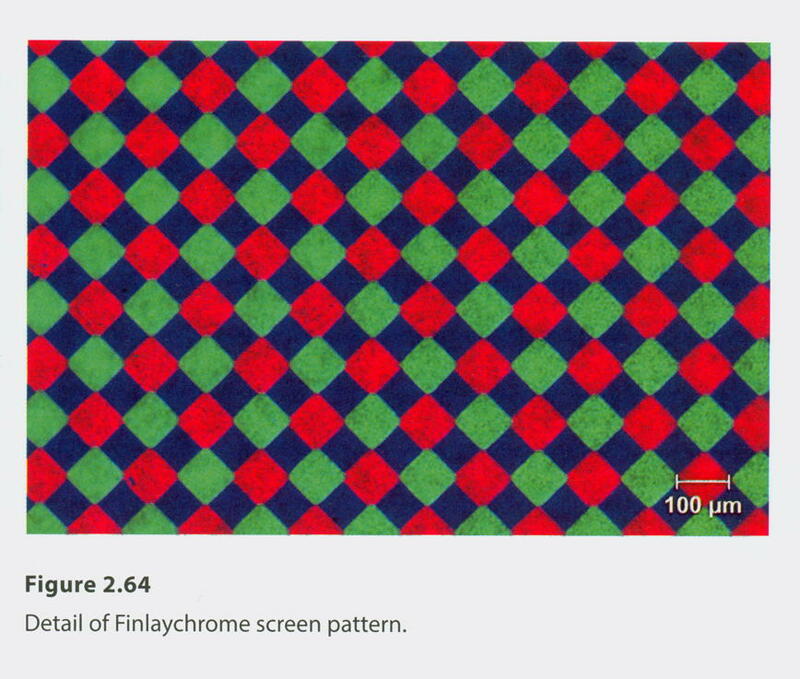 Finlay Colour Plates were manufactured until about 1939 but saw a very brief revival in 1953 when they were commercialized by the London manufacturer and distributor of photographic equipment Johnsons of Hendon Ltd. under the name Johnsons Colour Screen (Coe 1978: 68) (Fig. 2.22). 28 “Amongst screen-plate processes progress is seen in the new Finlay Non-Parallax plate and in the Finlaychrome plate shortly to be marketed” (BJP 1931). “And now a ‘Finlaychrome’ plate is announced which may be described briefly as a Finlay taking screen coated with a reversible panchromatic emulsion” (Camera 1932). “It is expected that the Finlaychrome (reversal emulsion coated on Finlay screen) will be available by the summer of 1934” (Photographic Journal 1934). British Journal of Photography (BJP). 1931. 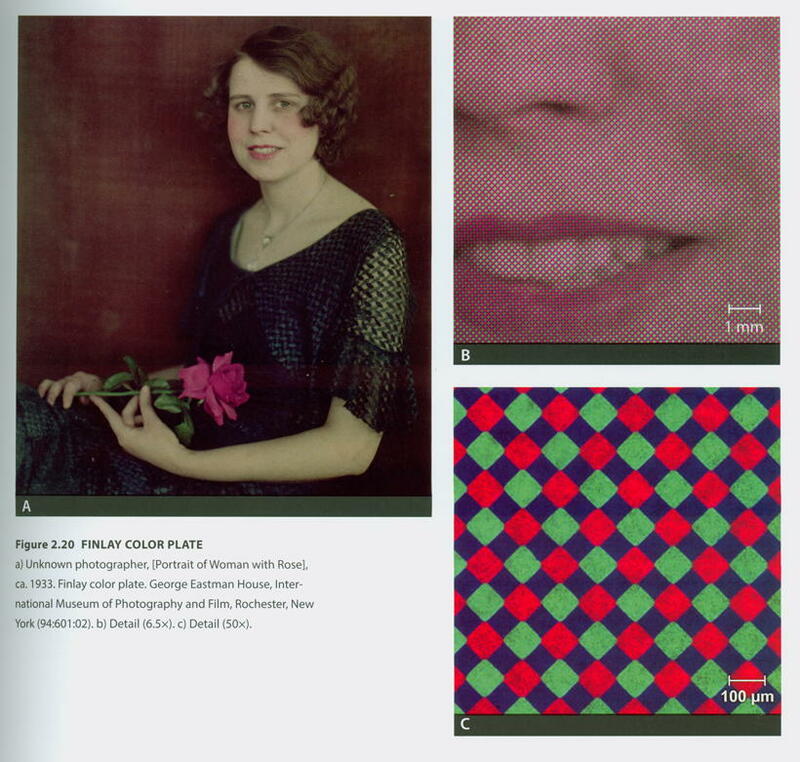 “Finlaychrome.” British Journal of Photography British Journal of Photography Monthly Supplement on Colour Photography 78 (1931): 686. British Journal of Photography (BJP). 1932. “Progress in the Finlay Colour Process.” British Journal of Photography Monthly Supplement on Colour Photography (Mar. 4): 9–10. Camera (Philadelphia). 1932. “Color Photography Notes: Recent Developments of the Finlay Color Process.” Camera (Philadelphia) 45 (4): 344–45. Coe, Brian. 1978. Colour Photography: The First Hundred Years, 1840-1940. London: Ash & Grant.